I can't remember the last time I made Rice Krispies Treats; maybe a couple decades ago when I was a young Chung. Last summer, my sister Melissa whipped up a batch to bring to work and I was like, whoa, these taste amazing (minus the fact that she used marshmallow from Trader Joe's. DO NOT USE THOSE...they don't get goopy and sticky like real marshmallows do). So when I was contemplating work treats for a couple of tiring work-filled days, I thought, "ooh Rice Krispies Treats to the rescue!" 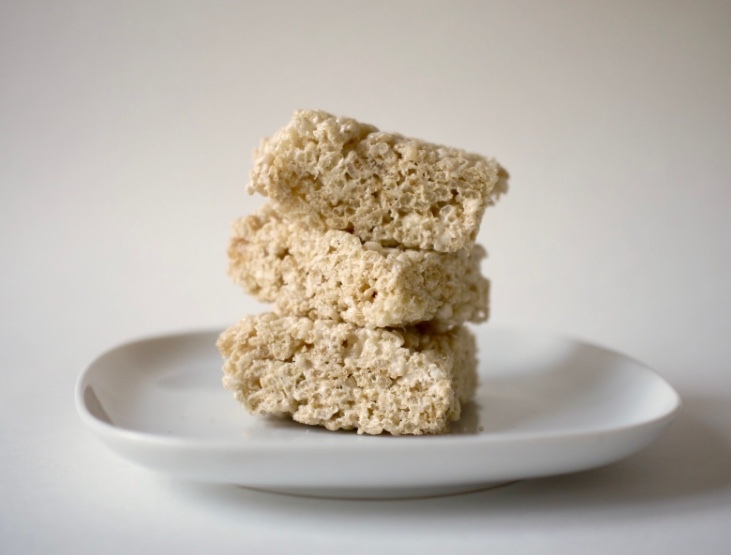 To give the Rice Krispies Treats an extra special something, try using brown butter. It adds a little bit of a nutty, caramelized flavor to the treats. When melting the butter, let it foam over medium-low heat and then keep a watchful eye on it and let it turn brown but not burnt and then add a dash of salt to it. The Recipe: The NY Times has a recipe for Caramelized Brown Butter Rice Krispies but I just used the one on the box.